If pressed, what would you say is the secret to product success? Certainly there are a number of things that go into making and selling products. Prioritization, design, manufacturing frameworks, marketing, service, cost of production, etc. Each of these elements needs to be optimized, and there are people, practices and tools that do just that. OK, forget that. Let’s assume rational, ambitious people want to do better. In a survey of B2B firms, people were asked to identify the causes of failed products. The top answer was ‘lack of market analysis’. As in, did the market have the need, did the feature address it if so, and did it do so better than competing products? The next answer was that the ‘product didn’t satisfy customer needs’. There’s a pattern here. Notice that pattern again? Products that succeed are designed and developed with customer insight. Researchers in Sweden conducted an analysis of firms’ product development efforts, classifying the products as successful or not successful. They tracked these product outcomes against the types of interactions the firms have with customers. Note they tracked product development efforts as incremental innovation. They separately tracked radical innovations as well. For incremental innovation – i.e. the daily work of product managers – they were able to identify three factors that separated successful products from the rest. Factors that affected the “absorptive capacity” of the company to assimilate customer needs. 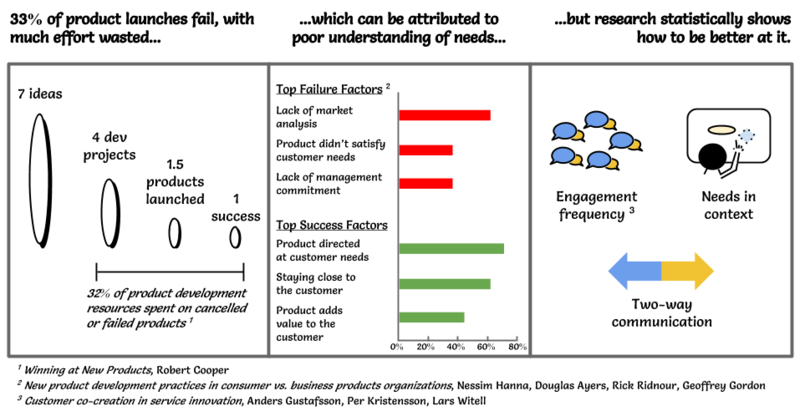 Engagement frequency: The more often a company communicates with customers, the more successful were it product releases. Communication can be oriented toward understanding needs, or for feedback on design iterations. Two-way communication: The nature of the communication dictates its value. If the company does all the talking, it’s not going to learn much. The more the communication is a dialogue, the better the outcome for the product. Needs in context: The more the insight is captured as part of a broader view of the activity, the better that insight is. Top insight is gathered as the customer experiences using the product. It’s also valuable to understand the why for insight. If the suggestion or need is in isolation, it can be hard to understand the core need. Now, who is in charge of getting this insight? But where are the comparable processes and people dedicated to understanding the customers’ needs? Who plumbs the jobs-to-be-done and analyzes the key outcomes customers are seeking? The work of understanding customer needs, in one sense, is everybody’s responsibility. It’s what makes the company grow. But if something is everybody’s responsibility, it’s really nobody’s responsibility. While Steve Blank’s excellent book is targeted at entrepreneurs who need to do the hard work of validating an idea, the mindset underlying customer development is well-suited for the need to stay close to customers. Hence, the notion of the Chief Customer Development Officer. And the product management team sits at ground zero in the customer development activity. You can’t wait for customer insight to come to you. You have to go after it with a club. This is a change in mindset for many. Be proactive in understanding customers. Make communicating with customers a meaningful percentage of the weekly schedule. Don’t settle for inbound inquiries. Or only focus groups on an already-designed product. Or quarterly customer council meetings. Really own the customer development activity. You only get these by being a proactive customer development officer. In a future post, I’ll examine the different ways engage customers in the product development process. Because there are many. Aren’t “directing a product at customer needs” and “product adds value to the customer” the same thing? What is “value” in this context, after all, if not addressing customer needs or problems? For example, the unique value proposition (MVP) should express an overarching theme of solving a cohesive set of market problems. I agree Roger, those two statements are pretty intertwined. If I were to defend the survey makers, I’d probably say that you can come up with features that are targeted at a need, but which miss the mark in terms of delivering value.